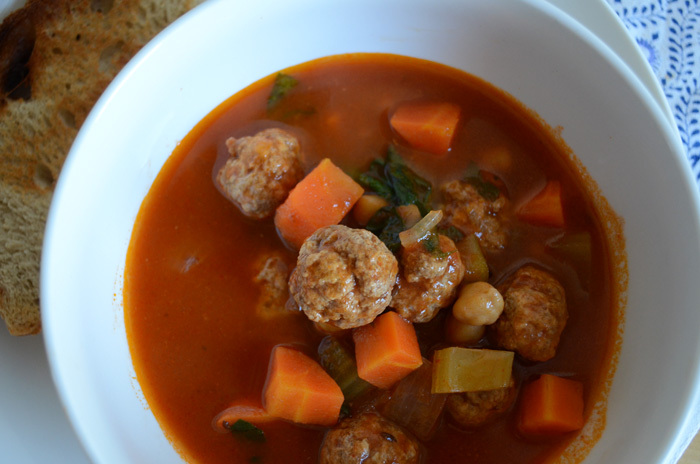 I know that most of the world is coming into Summer, but after a couple of really warm days NYC has retreated into a wet and cold, frankly quite miserable week — so something like this spicy meatball soup is just perfect. Plus, soups are really good for you all year around. This soup is slightly middle-eastern inspired, but very much my own concoction of what I like in a soup. This freezes well and I bring this for lunch a lot because it’s so healthy and filling. I like to heat the soup up nice and hot and pour it over a bunch of fresh basil and spinach – they soften nicely and add a vibrant freshness to the soup. 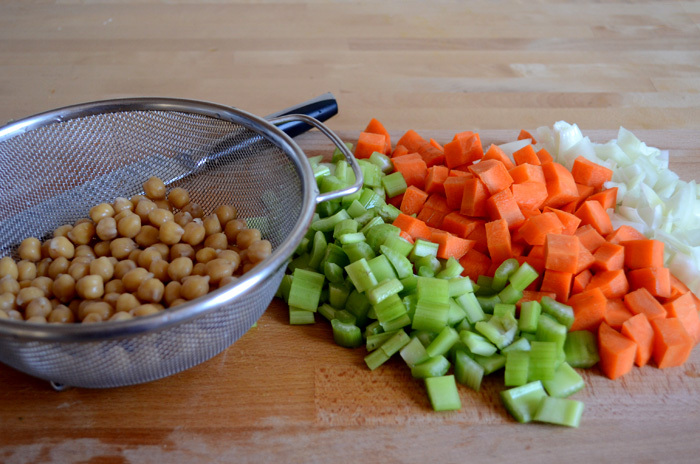 Start the night before by soaking the dry chickpeas. 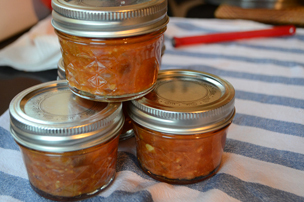 You could use canned chickpeas too, but I find that the dried ones hold up much better in a soup. 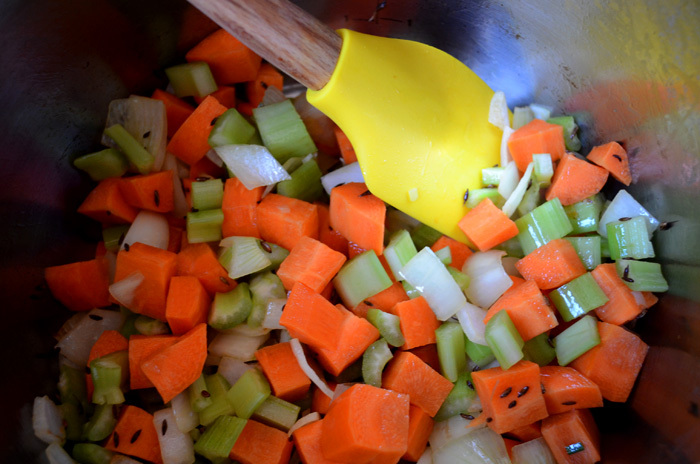 To prepare, chop the celery, carrots and onion to a similar size. I don’t like to make them too small because they will be cooking for a long time. Chop the parsley for later, and tomatoes if you are using them – they add extra sweetness but aren’t crucial to this dish. Heat 1 teaspoon of cumin seeds in hot olive oil until they start to sizzle and pop. Add the mirepoix and stir over medium heat for a few minutes. Once the vegetables are fragrant, add the tomato purée, tomato paste, tomatoes, chickpeas, water, spices, salt, pepper and parsley. Bring it to the boil and then reduce to a simmer. In the meantime, get the meatballs ready. 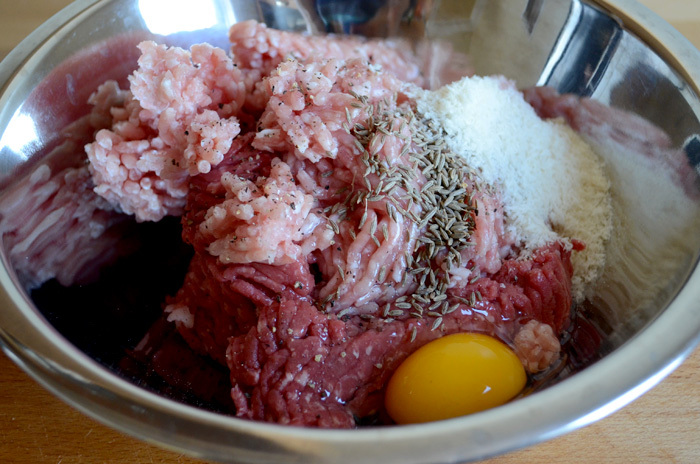 In a bowl, mix all the ingredients for the meatballs and knead well until it holds together on its own. 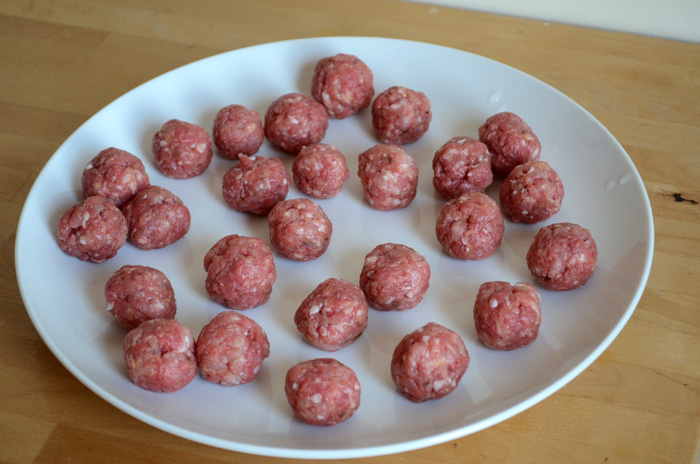 Form the mixture into small bite-sized meatballs, about one inch in diameter. 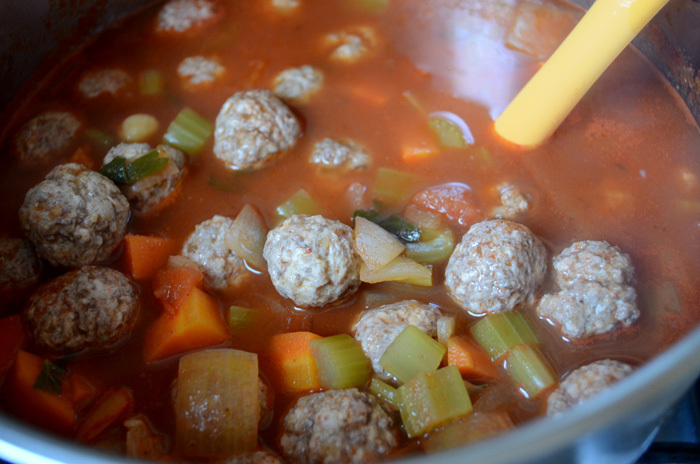 Gently drop the meatballs into the soup, being careful so that they stay separate. 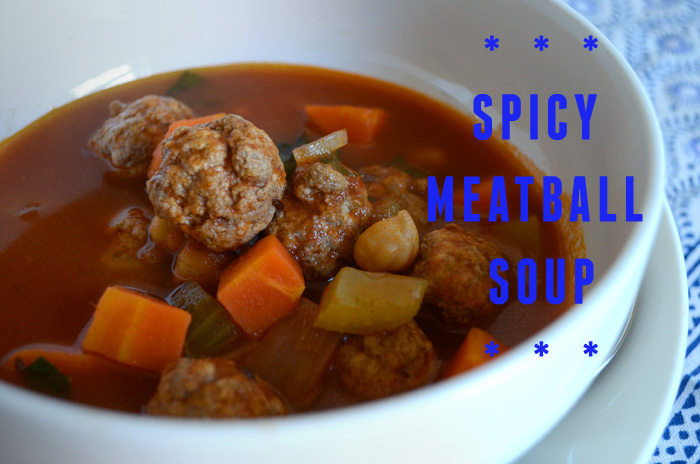 Cook the soup in a gentle simmer for another 30 minutes to an hour, adjusting the seasoning to taste and ensuring that the meatballs soak up some of the tomato flavor. To serve, wash a handful of spinach and basil leaves and place them in the soup bowl. 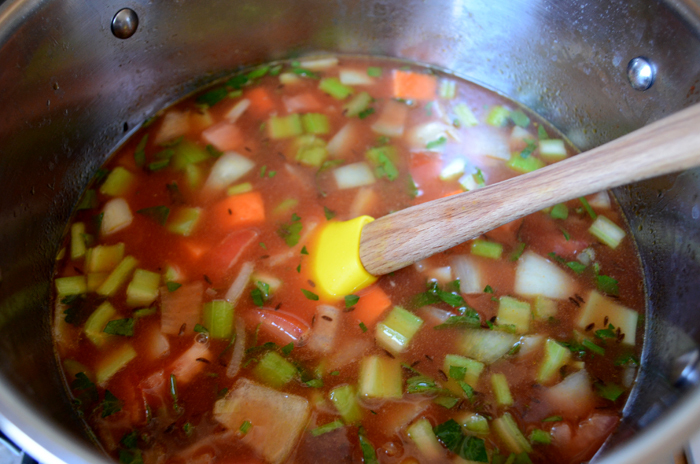 Pour the hot soup over the leaves, and pour a little extra virgin olive oil for fragrance. 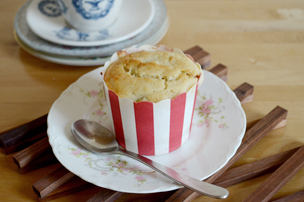 Serve with some crusty bread or some grains.